"Saturday Night Massacres don't need to happen on a Saturday," Sen. Patrick Leahy, D-Vt., said. As conflicting reports emerged concerning the fate of Deputy Attorney General Rod Rosenstein on Monday, Democrats sounded the alarm about what his potential departure from the Department of Justice could mean for the Russia probe. "Saturday Night Massacres don't need to happen on a Saturday," Sen. Patrick Leahy, D-Vt., said on Twitter, referring to former President Richard Nixon's firing of a special prosecutor and acceptance of two top Justice Department officials' resignations during the Watergate scandal. "If President Trump fires DAG Rod Rosenstein or forces his resignation, he will come one giant leap closer to directly meddling with the Special Counsel's Russia investigation." In his role, Rosenstein oversees special counsel Robert Mueller's investigation into Russian election meddling and President Donald Trump's campaign. 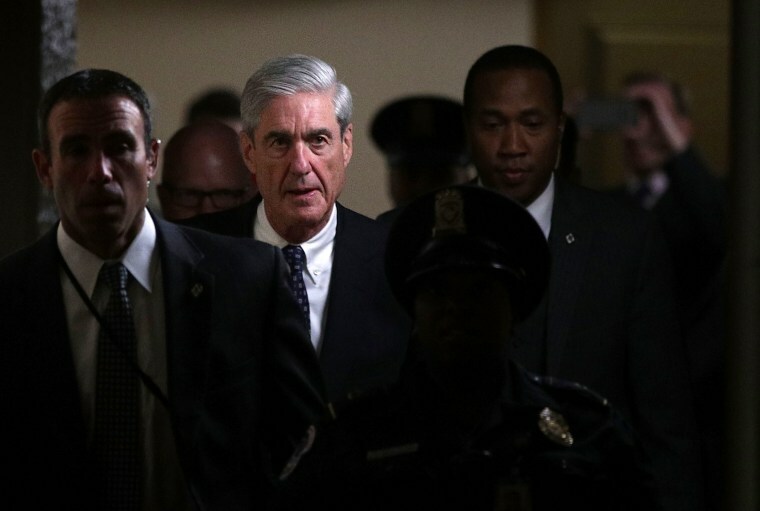 Mueller was appointed by Rosenstein after Trump fired FBI Director James Comey, telling NBC News at the time he was frustrated with the agency's investigation into his presidential campaign's contacts with Russians. He has repeatedly condemned the probe as a "witch hunt." The president is scheduled to meet on Thursday with Rosenstein at the deputy Attorney General's request, according to the White House. Republicans have previously said that legislation to protect the Mueller investigation was unnecessary, but Monday's developments have fired up Democrats anew. Democrats have been putting together a contingency plan for Rosenstein or Mueller's firing for months, vowing a crisis response that would include enormous protests and legislating to try and protect the investigation's documents from being destroyed or his team being disbanded. Saturday Night Massacres don't need to happen on a Saturday. If President Trump fires DAG Rod Rosenstein or forces his resignation, he will come one giant leap closer to directly meddling with the Special Counsel’s Russia investigation. Leahy and other legislators including Sen. Brian Schatz, D-Hawaii, and Sen. Kirsten Gillibrand, D-N.Y., on Monday called for the passage of bipartisan legislation designed to protect the special counsel’s investigation. Sen. Kamala Harris, D-Calif., called for a vote to occur immediately. “We can no longer afford to wait,” she wrote in a tweet. The Senate must pass legislation to protect special counsel Robert Mueller TODAY. Republican leaders must allow it to be voted on. We can no longer afford to wait. This is a matter of preserving the rule of law. "Congress must take immediate steps to uphold the Constitution and the rule of law—which protects all of us—by shielding the Mueller investigation against President Trump’s obstruction," Rep. Val Demings, D-Fla., said in a statement released while Rosenstein's job status was still up in the air. Rep. Elijah Cummings, D-Md., the ranking Democrat on the House Oversight Committee, called for emergency congressional hearings, saying that Rosenstein's removal "would pose a serious and profound threat" to the Mueller investigation. "If President Trump forces out Mr. Rosenstein — regardless of how it happens — the American people deserve a full and complete accounting of these actions, and the Oversight Committee should hold an immediate emergency hearing with Mr. Rosenstein, obtain all the emails and other correspondence from the White House and Justice Department, and start conducting transcribed interviews and depositions about this decision," the Maryland Democrat said in a statement. Former FBI deputy director Andrew McCabe, who was fired by earlier this year, also expressed anxiety about the fate of Mueller's investigation. “There is nothing more important to the integrity of law enforcement and the rule of law than protecting the investigation of Special Counsel Mueller. I sacrificed personally and professionally to help put the investigation on a proper course and subsequently made every effort to protect it," he said, adding that he did not leak any news to the media after former FBI Director James Comey's firing. "If the rumors of Deputy AG's Rosenstein’s departure are true, I am deeply concerned that it puts that investigation at risk." While many Republicans held off on speaking out publicly about the conflicting reports, Rep. Mark Meadows, R-N.C., condemned the Department of Justice and called to "declassify everything." "It is time release the documents. Declassify everything. Stop the games and show Americans the truth about what has gone on at the DOJ and FBI," he said in a statement, reiterating previous requests made with the stated goal of exposing and undermining the Russia probe.